I tried to plan as much of my 2018 PCT thru-hike as possible. What I found was, it doesn’t matter how much time I spent putting my PCT resupply strategy together because once I got on trail, most of my plan went out the window anyways. 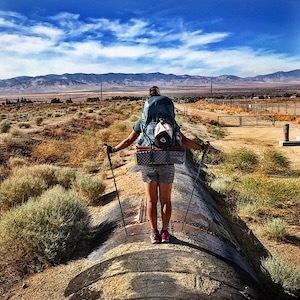 There are too many variables that can change with a long-distance hike – your hiking pace, getting injured/sick, bad weather, how many zero days you decide to take and the actual town stops you make. In 2019, I’ll be thru-hiking the PCT again, but I didn’t do nearly as much planning this time around. My planning has consisted of putting together a list of towns I want to stop in, where I’ll send myself a resupply box on trail and a side trip to take before entering the Sierra in June. That’s it. I refuse to plan out every detail of my hike like I did last year because I found it to be a waste time. Here are 8 things I plan on doing differently in 2019. The first thing I’ll do differently is not send myself any resupply boxes until Kennedy Meadows South. In 2018, I always had way too much food, especially at the beginning in the desert. For the four towns I sent myself resupply boxes to (Mount Laguna, Warner Springs, Paradise Corner Café and Big Bear Lake), I always had more than enough food. I ended up giving most of the food I sent to myself to my trail family and then donated the rest of it to a Hiker Box. What a waste of money on food, box pickup fees and postage! In 2019, I’ll resupply as much as I can as I go. In 2018, I sent myself a Bounce Box to Big Bear Hostel and to South Lake Tahoe. I found a Bounce Box to be an unnecessary expense and inconvenience. I could’ve saved myself money on the postage and bought the items in town instead. Plus, the Bounce Box I sent to myself in Tahoe got lost and showed up back at home long after my thru-hike. If I find myself with extra stuff this year, I’ll either donate it to a hiker box or send it home instead of bouncing it forward to myself on trail. KM South was overly priced for everything – food, snacks, drinks and picking up a box. The hiker box here was pretty good and is worthy of taking a look before buying anything for a resupply. KM South and beyond (all the way to North Kennedy Meadows) is when you’ll need to carry your food and smelly items in a bear canister. If you don’t send yourself a bear canister here, buy one at Yogi’s outfitters, Triple Crown Outfitters, which is across the street from Grumpy Bear’s. Grumpy Bears is five miles down the road from KM South. You can easily resupply at Triple Crown Outfitters if you want to. Yogi has an amazing selection and her prices are very reasonable. Since I already bought my bear canister last year at Yogi’s, I’ll have it send it to Grumpy’s and resupply for anything else I need at Triple Crown Outfitters. After having to get to Lone Pine via the Whitney Portal (one of my toughest days on trail) and then having to say goodbye to Bleeder in Lone Pine, I never want to visit Lone Pine again. Independence had nothing in terms of a decent resupply. Hikers on trail couldn’t stop talking about Bishop. Apparently, it was a great resupply stop and there’s a cheap hostel everyone loved staying at. We will be staying in Bishop in 2019 and resupplying there. Vermillion Valley Resort/Mono Hot Springs was tough to get to. You either had to take the ferry across Lake Edison, which only ran twice a day or you could hike the Bear Ridge Trail around the lake, which added an additional 8 miles. VVR was terribly expensive. Mono Hot Springs was amazing, but easy to get vortexed into taking multiple zero days and was pretty pricey. In 2019, we will stay closer to the trail and spend a zero day at Muir Trail Ranch. I hear its pricey too, but its closer to the trail than VVR/Mono Hot Springs and meals are included in the accommodations. Plus, rumor has it the Muir Ranch hiker box is the best on trail because all the JMTers donate their extra food here. We’ll be shopping out of the hiker box here for sure! In 2018, I had originally planned on resupplying in Belden, but took an afternoon detour into Bucks Lake instead. We got an easy hitch into town. I resupplied at the small general store, packed out a couple deli sandwiches, had lunch at the Lakeshore Resort (skip Bucks Lake Lodge) and then hitched an easy ride back to the trail. At Belden, we literally walked into the middle of an outdoor music festival from the trail. It was overwhelming and chaotic. The general store was well stocked but way overpriced. Instead, I got a ride from a trail angel to the RV Park, took a shower, did my laundry and then hitched a ride back to the trail from the same trail angel and headed towards Chester. One of the many lessons I learned hiking the PCT in 2018 was to be flexible and go with the flow. No matter how much time I put into putting together a plan, the plan was always subject to change. Once the wildfire season got underway, the fire closures and reroutes started happening on trail and the thick smoke rolled in, all bets were off for planned town stops. Hikers are truly at the mercy of Mother Nature. Go ahead and make a resupply plan, but be okay knowing the plan can change because there’s a 99.9% chance it will. That’s just how thru-hiking goes. Muir Trail ranch is very expensive and they are not too flexible. They close at 5 pm. Unless you know the exact date that you’ll be at Muir Trail ranch, I would not make accommodation reservations. Use the hiker box for your resupply and take a zero at the campground just outside the ranch. They do have a small gear shop with some smaller items. Just my 2 cents that I learned last year. Thanks for the info! I’ve heard both good and not so great things about Muir Ranch from other hikers. I had trail friends stay at the ranch in 2018 and they loved it. They said it was one of their favorite stops. We’ll play it by ear on making reservations. It all depends on the snowpack this year and when we’re able to enter the Sierra safely. I’m going to hold off on making reservations as long as I can.